Over the past few weeks, I have had the pleasure to work side-by-side with Matt Graeber (@mattifestation) and Casey Smith (@subtee) researching Device Guard user mode code integrity (UMCI) bypasses. If you aren’t familiar with Device Guard, you can read more about it here: https://technet.microsoft.com/en-us/itpro/windows/keep-secure/device-guard-deployment-guide. In short, Device Guard UMCI prevents unsigned binaries from executing, restricts the Windows Scripting Host, and it places PowerShell in Constrained Language mode. I then started looking for a Microsoft compiled version, which led me to the “Microsoft Roslyn CTP” download page. Unfortunately, this requires Visual Studio 2012 and the VS2012 SDK installed, but those are freely available. 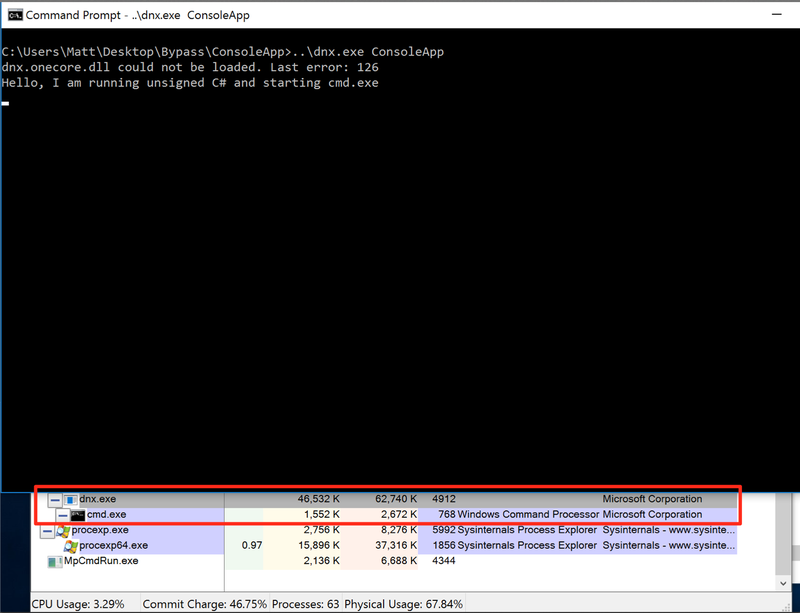 Recently, my co-worker Casey Smith (@subtee) blogged about bypassing application whitelisting using csi.exe. The difference between these bypasses is csi.exe is interactive and rcsi.exe is not. Luckily for us, you can utilize the introduction of C# Scripting with rcsi.exe to execute unsigned code. In a Device Guard scenario, rcsi.exe is allowed to execute as it is a Microsoft signed binary that can be installed along side of Visual Studio 2012. In order to execute rcsi.exe on a Device Guard system (assuming it isn’t already installed), you will need to gather rcsi.exe and its required dependencies (there are only 2 of them), and transport everything to your target (this is an exercise left up to the reader). With everything required now on our target host, we can now start down the path of bypassing Device Guard’s UMCI. Since rcsi.exe allows for executing C# scripts, we can use it to execute arbitrary, unsigned C# code by passing the binary our own csx script. As you can see above, our unsigned C# successfully executed and is running inside of rcsi.exe. Over the past few weeks, I have had the pleasure to work side-by-side with Matt Graeber (@mattifestation) and Casey Smith (@subtee) researching Device Guard user mode code integrity (UMCI) bypasses. If you aren’t familiar with Device Guard, you can read more about it here: https://technet.microsoft.com/en-us/itpro/windows/keep-secure/device-guard-deployment-guide. In short, Device Guard UMCI prevents unsigned binaries from executing, restricts the Windows Scripting Host, and it places PowerShell in Constrained Language mode. Recently, @mattifestation blogged about a typical Device Guard scenario and using the Microsoft Signed debuggers WinDbg/CDB as shellcode runners. Soon after, @subtee released a post on using CSI.exe to run unsigned C# code on a Device Guard system. In a Device Guard scenario, dnx.exe is allowed to execute as it is a Microsoft signed binary packaged with Visual Studio Enterprise. In order to execute dnx.exe on a Device Guard system (assuming it isn’t already installed), you will need to gather dnx.exe and its required dependencies, and somehow transport everything to your target (this is an exercise left up to the reader). With everything required now on our target host, we can now start down the path of bypassing Device Guard’s UMCI. Since dnx.exe allows for executing code in dynamic scenarios, we can use it to execute arbitrary, unsigned C# code. Fortunately, there is a solid example of this on Microsoft’s blog above. To satisfy the requirements of dnx.exe, a Project.json file is required, which specifies some of the requirements when executing the code. For this PoC, the example “Project.json” file can be used from Microsoft’s blog here. As stated in their post, we can execute our C# by placing “Program.cs” and “Project.json” in a folder called “ConsoleApp” (this can obviously be renamed/modified). As you can see above, our unsigned C# successfully executed and is running inside of dnx.exe.